DEMONSTRATION in Solubility, Physical Change, Solute & Solvent. Last updated April 2, 2019. Understand that dissolving sugar in water is a physical change. Define saturated and supersaturated solution. Explain the scientific process associated with the creation of rock candy. Ask for volunteers to help you with the demonstration to keep students engaged. After one week, when you are ready to remove the popsicle stick from the solution, use a spoon or your stirrer to gently break the sugar crust that formed along the top of the solution. Once this crust is broken, the popsicle stick should be easy to take out. When cleaning your microwave-safe container after the lab is complete, you may find that sugar crystals are difficult to remove from the sides and bottom of the container. If this is the case, add hot water to your container to let the sugar crystals dissolve. You may need to empty and refill your container with hot water a few times before all the sugar crystals come out. Teachers may want to consider doing this activity on a smaller scale, using small student groups to each create their own solution—depending on the age and ability of students. Additionally, a similar experiment from the AACT library that may be of interest to teachers is, Winter Crystals. How many students have had rock candy before? What do you think are the ingredients in rock candy? Pass around store bought rock candy (without the label) and ask students to infer which ingredients are in rock candy. You may let students have a small taste of the rock candy if you choose. When sugar is added to water, the sugar crystals dissolve. When you add sugar to the point it can no longer be dissolved, the solution is called saturated. Saturation points can be different depending on the temperature of the solution; higher temperatures can hold higher amounts of sugar. When candy is done cooking and begins to cool, there is more sugar in the solution than typically possible and the solution is supersaturated with sugar. In a supersaturated state, sugar will begin to crystallize into a solid state. Understanding how sugar crystallizes is important in the candy making business; if recipes are not followed correctly, sugar crystals can form and give candy a grainy texture. One way to prevent crystals from forming is to add an acid like lemon juice to break up sucrose into fructose and glucose. Fatty ingredients like butter also help to block the crystallization process. [Optional] Watch a video that describes how to make rock candy, which is the crystallization of sugar. Add 3 cups of sugar to a microwave safe cup. Add 1 cup of water to the cup and mix well. At first, this mixture will be difficult to stir. Microwave for 2 minutes on high. Note: Glass containers will become very hot in the microwave—make sure to use oven mitts if your container becomes hot! Remove the mixture from the microwave and stir. Microwave for another 2 minutes on high, stir. The mixture will be done heating when the solution is clear, not cloudy. Add 2-3 drops of food coloring and stir again. Dip the skewer or popsicle stick in water and then roll in sugar and lay on wax paper for 15 minutes to dry. The sugar rolling can be done on a piece of wax paper or on a plate. Once the stick is dry, gently add it to the solution in the cup, securing it with a clothespin. Note: Adding the popsicle stick quickly into the mixture may cause some of the sugar to fall off. Try to keep as much sugar on the popsicle stick as possible. [Optional] Cover the solution with plastic wrap to prevent bugs or dust from falling in. Let the solution sit undisturbed for 1 week. Students should check the mixture every day and record observations. 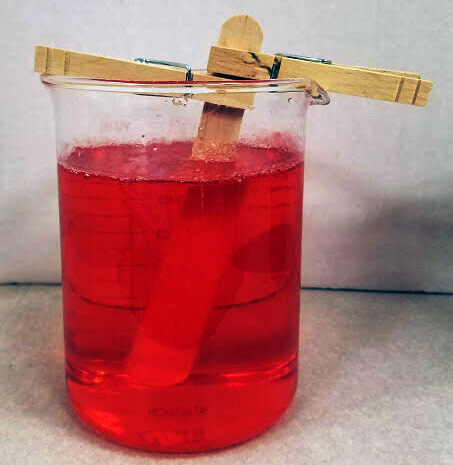 After one week, remove the popsicle stick and compare your results with store-bought rock candy. A supersaturated solution was created by heating the saturated solution and letting it cool down. Supersaturated means the solution contains more sugar (or other solute) than it can hold. The excess sugar precipitates out and forms a solid. This method is called precipitation. Another method is evaporation. When the water evaporates from the solution, it becomes more saturated. As the water evaporates, sugar crystals form. Day zero (Monday, when the experiment is started): Solution should be clear, the only sugar present is what may have fallen off of the Popsicle stick. Day 1 (Tuesday): Some crystallization may be forming a crust on the top of the solution, but the popsicle stick is largely unchanged. Day 2 (Wednesday): Crust on top of the solution is present. Some sugar crystals begin forming on the popsicle stick and on the bottom of the container. Day 3 (Thursday): Sugar crystals on the Popsicle stick are larger and more obvious. They should be growing where the rolled sugar was on the popsicle stick. Day 4 (Friday): Crystals are starting to form on the sides of the container, crystals on the popsicle stick have noticeably grown in size. 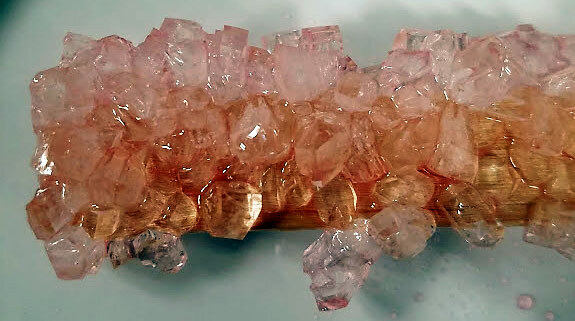 Day 7 (Monday, final day of the experiment): Really large crystals have formed on the popsicle stick (see photos below), lots of crystals are present along the bottom of the jar. Today you will observe how rock candy is made in order to understand how sugar crystals form. You will learn about a supersaturated solution and how it is relevant to sugar crystallization. What is a physical change? What is a chemical change? Give an example of each. Why is it important to understand how sugar is crystallized? What would happen if we were making candy and didn’t understand how crystals are formed? You will watch the teacher demonstration. Check the solution every day and record your observations. Carefully look to see if anything in the container has changed from the day before! After one week, compare your results with store-bought rock candy. What do you think would happen if we didn’t heat up the solution? Would the results be the same? Why do you think we rolled the Popsicle stick in sugar before adding it to the solution? What type of change(s) happened in the container? Were there any physical changes? Were there any chemical changes? Explain. Based on your observations, what do you think would happen if we left the solution there for 2 weeks?